I’ve been passionate about workplace design for over 20 years, in fact I think my interest started way back when I redesigned my bedroom in preparation for my GCSEs. My Dad had bought me a large office desk that was surplus to requirements and it transformed my home working environment. It was my treasured companion for 10 years as I moved all over the country, this desk saw me through, my a-levels, degree and masters programme. It finally went to a good home when we needed the room it occupied for my new born second daughter. I’ve been reading about and experimenting with designing offices ever since. I did my first full design to improve a portakabin that I shared with 6 other people, then I designed a whole building floor for 200 top engineers, and a large temporary building for 50 people engaged in an intensive 6 month training course. When I finally got a building floor of my own, my team and I designed a ground breaking space that allowed me to prove many of my ideas, which I later transplanted into a traditional office. My friend Graham Chastney who shared in these last two workplace adventures has been writing a series of great articles on workplace design and I’d wondered whether there was more to say. I’ve been mulling it over and I’ve decided there is. I’ve been pondering writing a series of books when I have time. For now I’ve decided to start sketching out my ideas for these books through a series of web articles. One of the books I want to write is about workplace design. This post serves as an introduction to this series of articles. It will provide a rough outline of the content that I’m hoping to cover. I’m going to go beyond the physical workplace in these articles, considering people, culture, technology, environment, change and much more. The ROI for good workplace design, workplace design needs an ROI, what are the costs and the potential benefits. is the future of the workplace more expensive or less? The role of the home office in the modern workplace. More and more people are working from home, does that mean the modern workplace is no longer needed? The role of the coffee shop in the modern workplace. Many home workers are deserting the spare bedroom for the coffee shop, can we replace the expense of the office building with a Caffe Nero gift card? The role of co-working spaces as an inspiration for the modern workplace. When people outgrow coffee shops they are being tempted into dedicated co-working spaces, can we outsource the workplace, or learn from them? Do people need physical workplaces when they have virtual workspaces. We often here people say my laptop is my workplace, I can work anywhere. Virtual workspaces are important but they are only part of the story. Good workplace design considers mobile workers, home workers, visitors and office workers as part of an integrated whole. Isn’t the future of work mobile? Why all this talk about workplaces, isn’t the future of work mobile? Not all workplaces can be like the Googleplex. The tech billionaires have funded dramatic, bold experiments in workplace design. There’s something the other 99% of the world can learn from them, but should they try to copy them? The trend to co-locate, recently there has been a trend to return to co-location, as the optimal workplace model, after a decade of encouraging home working, this is often linked to new management practices like agile. Architects and internal designers. All too often architects start with the fabric of a building, trying to make a bold statement that appeals to the CEO, the people who work there have to fit into the architects concept. Good workplace design starts with the people and makes the fabric serve them. The effect of workplace design on culture. It’s worth considering the culture you want to develop before you design the type of workplace that will enhance it. Designing for the future of work, the way we work is changing, with less hierarchy, virtual teams, small agile teams. How does this new way of working affect the design of the workplace? A suggested workplace strategy. A workplace strategy needs to be more like designing a city, than designing a building. This post tries to tease out a suggested strategy, much like a city master plan. Details matter in modern workplace design. Workplace design needs to work at the macro level, but it’s the details that really matter, how do we get those details right? The future of the workplace. Workplace design will continue to evolve, what’s on the horizon that might effect our decisions today. 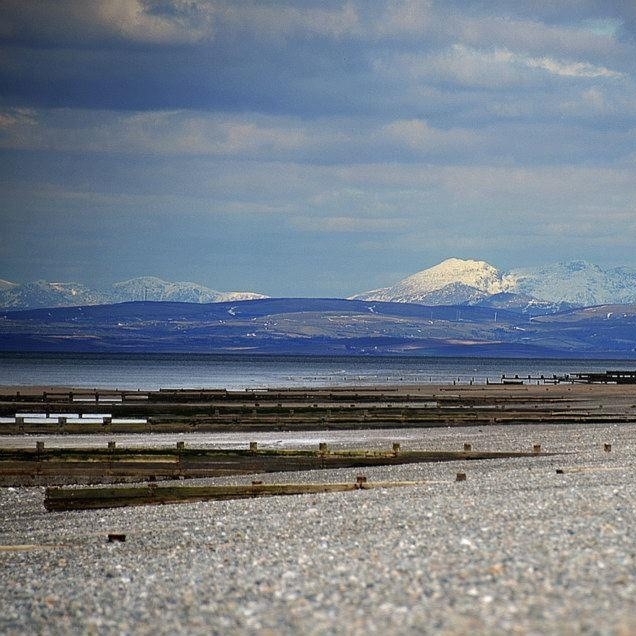 The photo above is of Cleveleys beach with the mountains of the Lake District in the background. This is the view from one of my favourite summer work spots, The lovely Cafe Cove and Rossall Beach where I like to work from my car. Picking up on your Cafe Nero comment, for obvious reasons, there are certain coffee shops I’ve now been forced out off due to their use as office meeting room extensions. Too many employees talking loudly on their phones and to each other without any regard for non-employees is extremely irritating and having to don earphones to drown them out is ridiculous. And it will only get worse. Any plans to write this book? In the end I decided that all the most interesting things I’d put in the book were already posts on the blog and the book would just be hassle with not much more benefit.